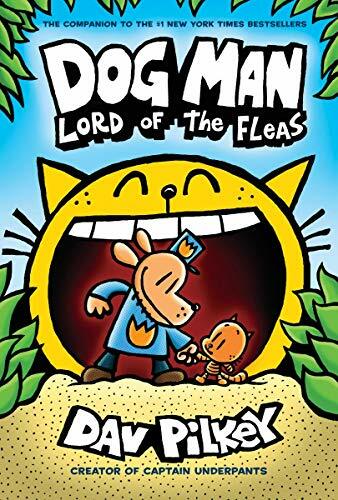 With this fifth graphic novel in the Dog Man series, Dav Pilkey shows no signs of slowing down. Lord of the Fleas is packed with all the visual gags, bad puns, and nonstop silliness his readers have come to expect, along with (gasp!) a few genuinely heartfelt moments. As always, the art is funny, colorful, and engaging, rendered (supposedly) by Harold and George of Captain Underpants fame. The plot kicks into motion when a supposed representative of Kitty Protective Services comes to take Lil’ Petey (the clone/son of Petey, the world’s most evil-est cat) away from Dog Man, who has been taking care of the kitten. Of course, the representative turns out to be none other than evil Petey himself in disguise. Through a series of flashbacks, Petey recounts to Lil’ Petey the tale of how he turned evil, interrupted at every turn by the kitten. When three badder bad guys show up, led by the villainous Piggy (in a nod to Lord of the Flies), Lil’ Petey tries to convince his father, “You can change, Papa.” He urges the doubtful Petey to fight on the side of good. Through an epic battle involving a robot brontosaurus, a giant cat robot, fight scenes in Flip-o-Rama, and massive silliness, the kitten continues his faith in Petey, helping him to see the light. It’s safe to say that Pilkey’s legions of readers will gobble up this latest installment of Dog Man like the hero himself would tackle premium dog chow.